We have a winner! Stephanie brought her winning quilt in to the shop on Friday July 22, 2016. Stephanie featured the names of her three children in her Game Board Quilt, along with inspirational words. When her husband asked where his name was, she said it was "Love." Stephanie pieced, machine quilted, bound and labeled the quilt herself. It is on display in our classroom. Stephanie's Shop Basket includes 13 one-yard cuts of fabric, several rulers and patterns, plus an Art Bin storage container. 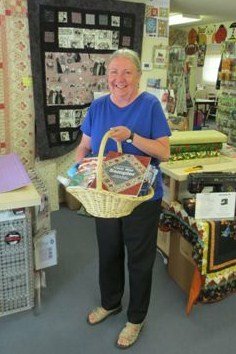 Our 2016 Quilter's Run Shop Basket Winner! 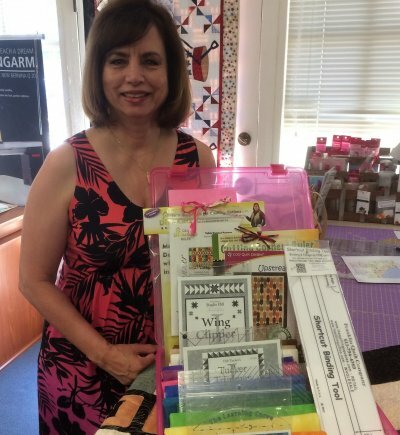 Our 2013 Quilter's Run Shop Basket Winner!